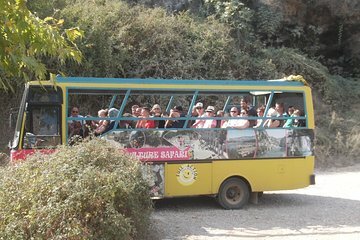 Take the scenic route on this full-day safari from Side and enjoy panoramic views from your specially designed Cabrio Bus as you journey through the Taurus Mountains. Discover Side’s rich history and cultural heritage as you explore the ruins of Seleucia, one of the ancient Pamphylian cities, visit the beautiful Manavgat waterfall and tour a local village mosque. The guide was reluctant to go to Seleukeia, and only when me and another lady on the bus said we only booked the tour because of the ancient city, we did go there for about 15 minutes. Other than that the tour was fine, a nice dinner at a beautiful lake and lots of other places of interest. Good value for money!